“Clearcut on Crown land in the Oak Lake area west of Lake Paul, fall 2017. It was a hardwood hill (predominantly sugar maple/red maple) overlooking the lake. 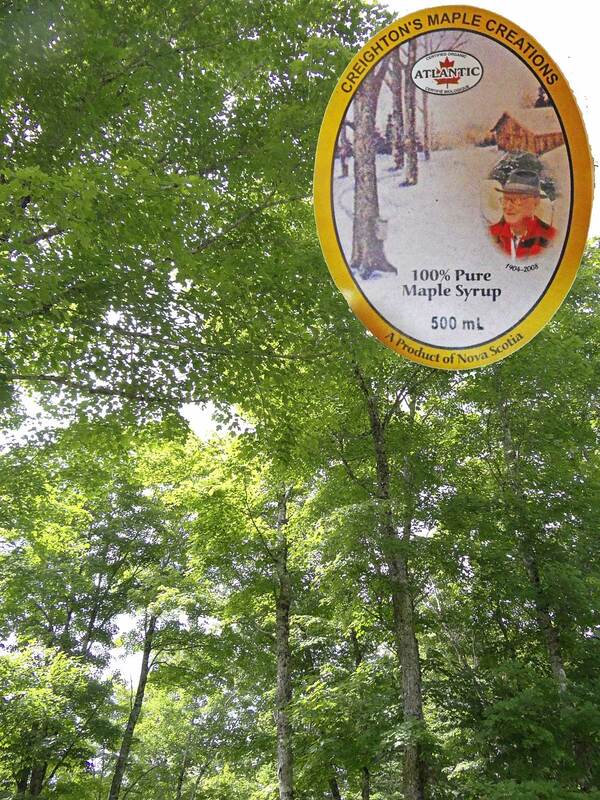 A local maple syrup producer would have leased the Crown property for a sugar bush.” – Bob Bancroft. 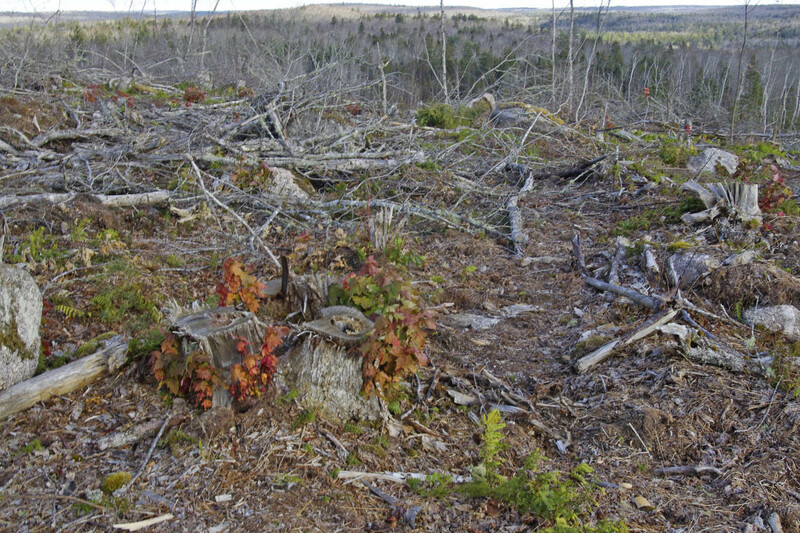 I have commented before on losses of nutrients, especially calcium, in forest soils over a large portion of the Nova Scotia landscape due to acid rain combined with the the inherently poor buffering capacity of forest soils developed on slates, granites and felsic bedrock on about 60% of our landscape. Clearcutting increases the losses through direct removal in harvested biomass and through increased leaching and loss of topsoil. The loss of calcium in particular has been recognized as a major ecological issue for forests in northeastern North America affected by acid rain. Declines in calcium under forests are having diverse adverse effects either through calcium deficiency directly or indirectly through enhanced aluminum mobilization and mercury toxicity, effects being observed on zooplankton, forest herbs, invertebrates, song birds, cold tolerance of red spruce , sugar maple decline, loon reproduction. Map shows watersheds of the endangered Southern Upland salmon populations and the average pH of surface waters. Salmon populations in SW Nova Scotia have been the most severely impacted by acid rain. “Salmon populations in extremely acidified systems ([RED] pH <4.7) are thought to be extirpated (13 rivers), reduced by 90% in moderately impacted systems ([YELLOW] pH = 4.7-5.0; 20 rivers), reduced by about 10% in slightly impacted systems (pH = 5.1-5.4; 14 rivers), and apparently unaffected when pH >5.4 (13 rivers) based on research in the 1980s.” Click on the image for a larger version and source. 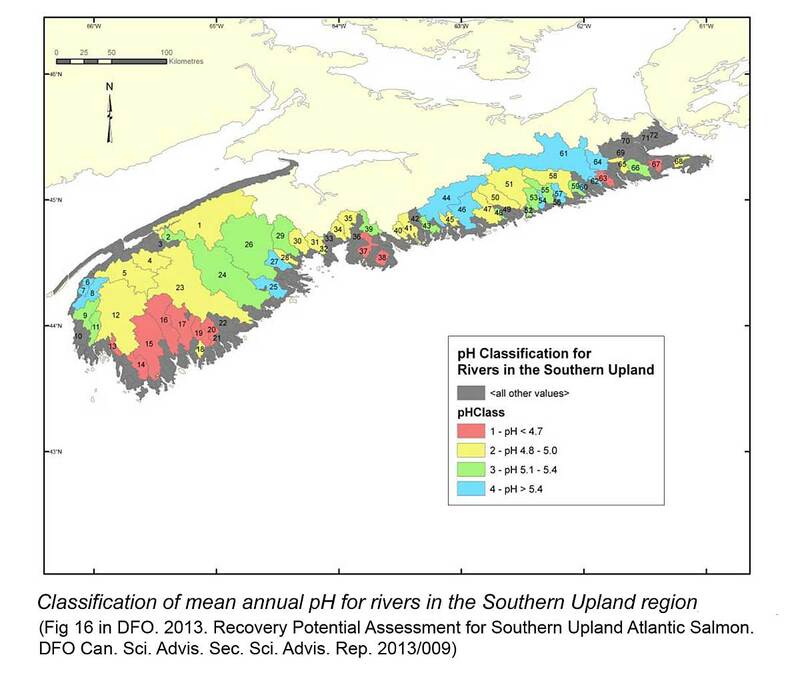 Declines in salmon in the 1980s and 1990s due to acidification of surface waters, especially in SW Nova Scotia, should have raised concerns about the calcium status forest soils in the affected watersheds. The link to forest soil acidification was clearly identified quantitatively and geographically in 2006/2007. For most of northeastern North America, trends of increasing acidificaton of surface waters (related to loss of calcium in the uplands) have reversed, following 30 years of emission controls, but not so in Nova Scotia’s “southern uplands”, with SW Nova Scotia the most heavily impacted area. Based on comparisons with NBM-NS [Nutrient Budget Model—Nova Scotia] output, approximately 1/4 to 1/2 of the  assessed plantation sites have non-sustainable MMAI [merchantable mean annual increment] yield expectations…Plantations with non-sustainable MMAI values are mainly associated with low soil weathering classes (especially Class 1) and/or tree species with high nutrient demands (e.g., Norway spruce). – A Simple Geospatial Nutrient Budget Model for Assessing Forest Harvest Sustainability across Nova Scotia, Canada by Kevin Keys et al. 2016. Open Journal of Forestry 6: 420-444. Remarkably, in 2018, NSDNR has yet to implement any consideration of nutrients in Crown land harvest decisions or even to highlight the issue as one that we need to be very concerned about. 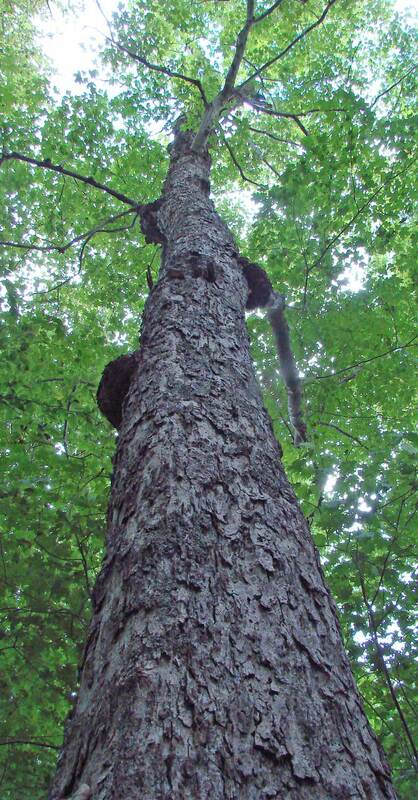 Keys’ paper is one of the few pieces of NSDNR forestry science submitted to a peer reviewed science journal, and it reports results that have big implications for forests and forestry in Nova Scotia, yet the work was not mentioned in the recent State of the Forest report, nor can I find any mention of the work on the DNR website, e.g. it’s not listed under on a Soils and Water page or Under Ecosystem Management > Tools. Keys, a very diligent researcher, rails at such comments, insisting that they need more data and to improve the model before they can implement nutrient budgeting in their Crown lands harvest decision process and that it would be irresponsible to put anything out before that’s achieved. But why can’t they talk about and apply in a precautionary way what we do know with a high degree of certainty now? We know, for example, that forested lands in SW Nova Scotia are especially prone to significant nutrient deficiencies, that clearcutting increases nutrient losses and we know from the work of aquatic scientists which watersheds are highly acidified (see map above) and hence in which watersheds clearcutting should really be avoided. 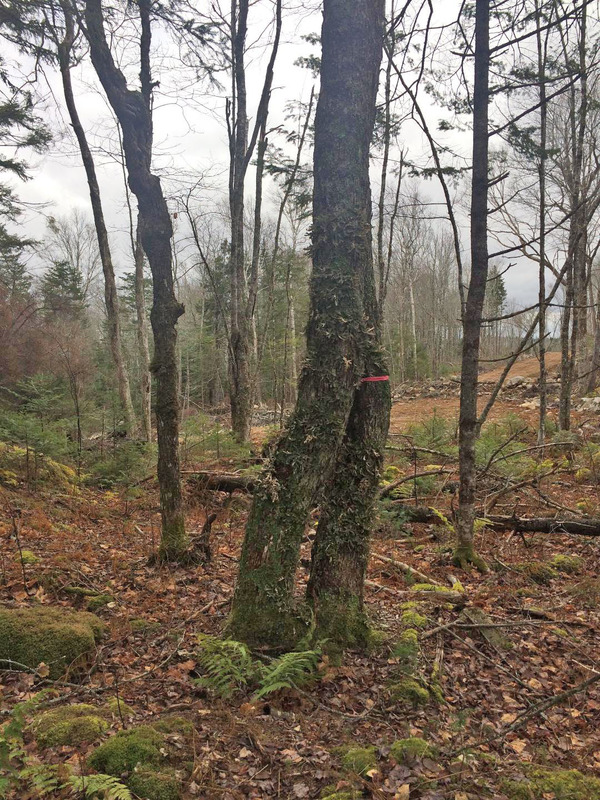 A good (but unfortunate) example of how the lack of any precautionary action on the issue may be undermining the future of our forests and options for utilizing them is provided by a recent paper based on a long term study at the Hubbard Brook Ecosystem Study site in New Hampshire. 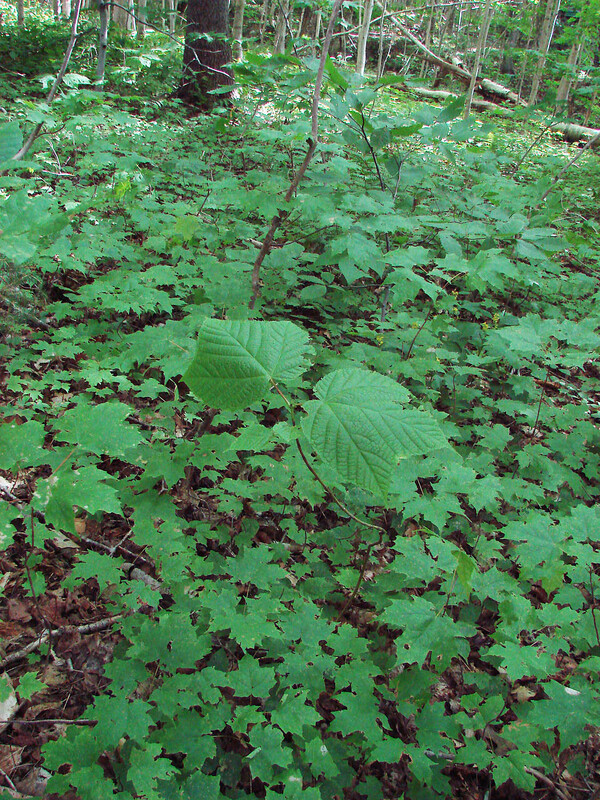 That research and also research in Quebec provides evidence that on moderately acidified soils, clearcutting can reduce the soil calcium levels to an extent that regeneration of sugar maple is impaired; at the same time, American beech – now problematical in eastern regions because most of it is diseased – is favoured, complicating efforts to reduce its abundance. The significance of “acidified soils” is that these are soils with moderate to low levels of soil calcium to begin with, the situation over much of Nova Scotia. I am guessing – perhaps I should say it’s an informed guess – that there is high likelihood that sugar maple found today on moderately to strongly acidified sites in SW Nova Scotia got established when calcium levels were higher 30+ years ago and is hanging on because of calcium accumulated in its earlier years – and that, as at the New Hampshire site, it won’t regenerate well after a clearcut. After the feller bunchers have gone, and with them, the sugar maple and the birds nests and the salamander habitat, silence reigns supreme, especially the silence from NSDNR on the subject of forest soil nutrient deficits in Nova Scotia. KT, Apr 1, 2018: Kevin is a great soil scientist (and the current president of RPFANS). And while I still firmly believe it is the landowners ultimate right to make an informed choice how to treat their woodlands, not much bugs me more than a tolerant hardwood clear-cut for this reason…well that and a butchered boundary line. 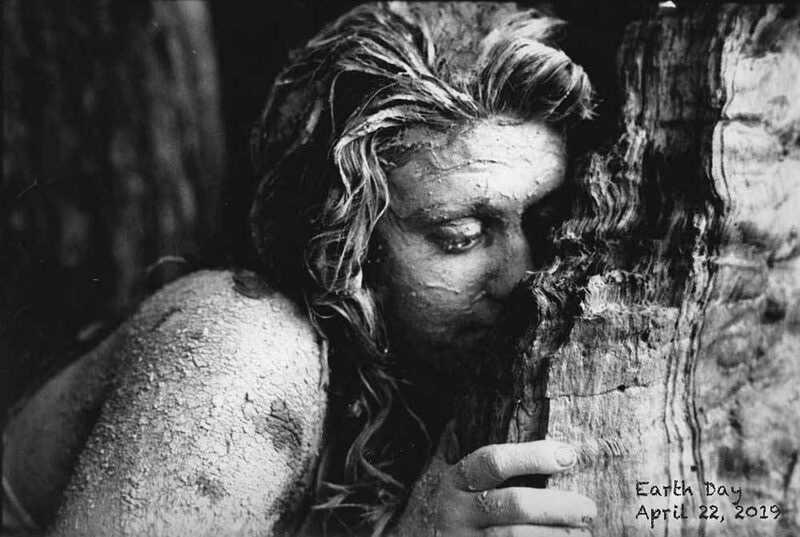 BW, Apr 1, 2018: It’s very frustrating that more “boots on the ground” assessment isn’t done before these tracts are designated for clearcutting. Why aren’t they properly vetted ahead of time by trained people? Why is it “too hard” for harvesters to avoid cutting down Sugar Maple because they can’t distinguish them from Red Maple? Why isn’t there auditing happening onsite during actually harvests – or a resource person onsite for consultation – is this being done? Would that be too hard – or is it too invasive having oversight during a harvest? How much follow-up is done after a cut — that year, and then in later years to see what’s happening — test the soil, test the watersheds, track the type of tree regeneration that occurs? I just read an article linked to one of the other articles mentioned in the above piece. It was about someone in Annapolis County who had recently graduated from the Nova Scotia Community College’s natural resources environmental technology program. If we’re so worried about not having jobs for young people here in NS, why not hire some of these graduates to do site assessments – before and after these cuts? Further, put some of them to work doing proper research into tracts before they are designated for cutting. A couple of days ago, in less than an hour, I was able to look up the NS Bird Atlas square map for that proposed clearcut in Shelburne County, and find what birds had been recorded in that square on two atlases. From what I could see, there are Canada Warblers in there (a Scehdule 1 Species at Risk “Threatened” species that breeds on forested wetland — and that’s what is supposed to be in that area — there are two large tracts of wetland in that cut). When I looked at the atlasing map, it was made by DNR a few years ago. From what I can see, the proposed cut is just a sort of overlay of all the areas marked as either mature conifer or “shrubby wetland” with little cut-outs around a couple of areas marked as mature deciduous. So, my question — how accurate are these maps? How well does anyone really know these tracts? Quite aside from the example of the Bird Atllas data, what other scientific studies and records do we have from there there? Does anyone check on this kind of data and information before marking up the next tract of land for cutting? Why not send in some of these graduates from the Nova Scotia Community College’s natural resources environmental technology program and have them check out these proposed cuts? Give some meaningful work to people. Do something serious to improve the system. Work with scientists and wildlife specialists who can identify valuable habitat or watersheds that are too stressed for clearcutting. 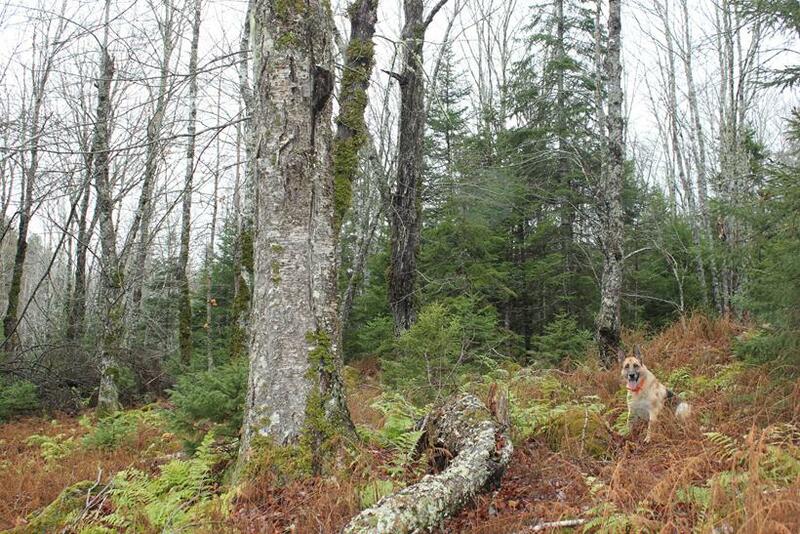 This entry was posted in clearcuts, hardwoods, NSDNR, Show Us the Science, Watersheds. Bookmark the permalink.